Be excited! Our friendly and welcoming staff will take good care of you! 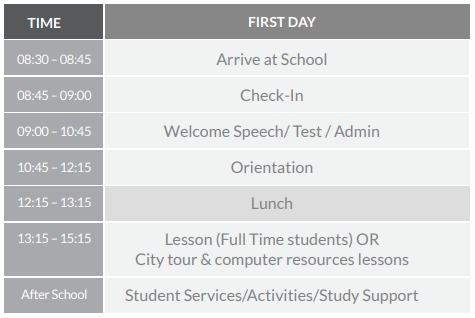 On your first morning please come to school at 8.30 – 8.45 a.m.
General English students will have an English test. Don’t stress! We just want to make sure we place you in the best class for your level! After this, we will show you around the school and introduce you to our lovely Student Services Department. We will also give you a thorough orientation and answer any questions you have! To help you prepare for your trip, please watch our Pre-departure guide video carefully for information about the school and what to expect when you come here. This information will help you adapt more quickly to your new life in New Zealand and at NZLC. You can also read through our Pre-Departure Manual. Available with subtitles in English, Spanish, Portuguese. Select setting on the bottom right corner and select the subtitles. • Passport & valid NZ visa. • Insurance certificate and insurance policy in English. • Your NZ home address and phone number. Read our Auckland – Handbook Student to ensure you are fully prepared for your arrival at NZLC and life as an international student in New Zealand.